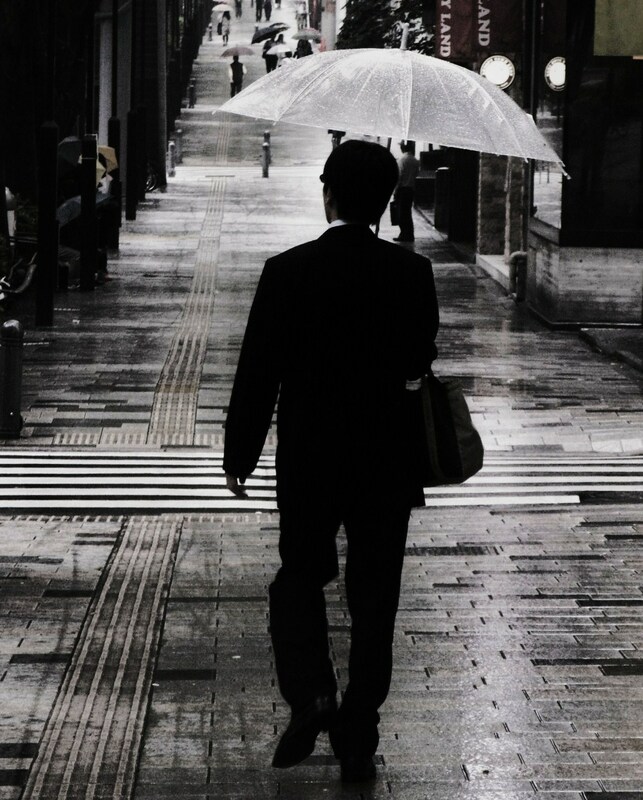 In Japan there are numerous onomatopoeia for the various types of rain and other watery sounds. “Pahrah-pahrah” is the sound of light rain and “zah-zah…” is the sound of heavy, pouring rain. “Pocha-pocha” is one of the ways splashing water sounds. 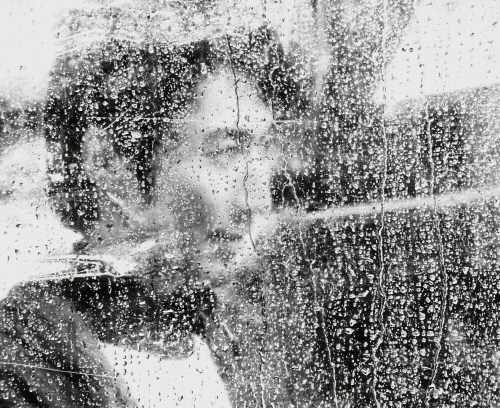 “Haru sa*meh“, not an onomatopoeia, but sort of one, is the sound and feel of rain in the spring. You get the picture. Kiyamachi, near Ni-jo Street. Kyoto. 2007. 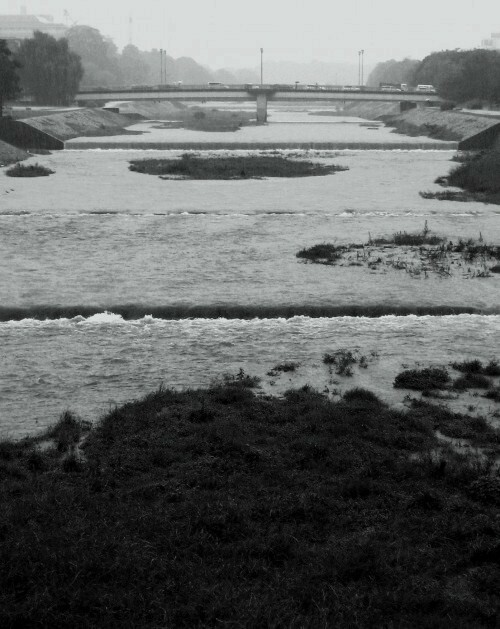 Kamo River, looking North. Kyoto. 2007. Ueno Shopkeeper. Tokyo. April 2008. Ueno. 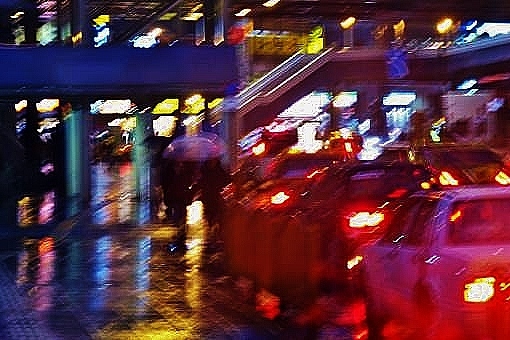 Street in the Rain. 2008. Office Staff. Hiroshima Downpour. 2008. Woman with Umbrellla, Man Indoors. Tokyo. 2011. Marutamachi Street. Kyoto. Nov 09. Chance encounter. Kawabata and San-jo Streets. Kyoto. Nov 09. 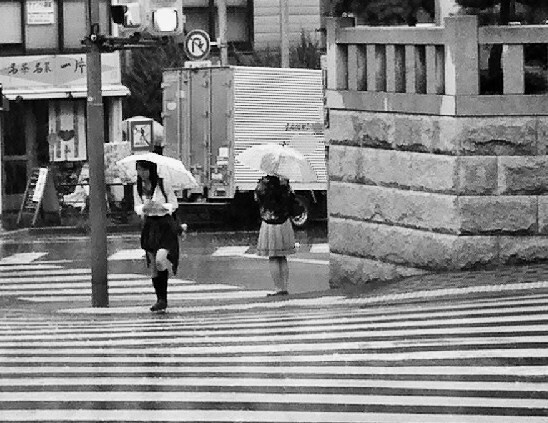 Soaked along the Kamo River. Kyoto. October 2007. A couple of people have emailed me, asking for a color photograph. Here are two . . .
Ni-jo, Kiyamachi Intersection. Kyoto. October 2007. They are all full of splashing beauty. Liked the shopkeeper one and all in all a good piece of work. B/W work is different as we grew up with colour and can be tricky. I need to dust off my old skills. Thanks, mate! That was one of those shots that felt “right” when I saw it and took it. Anyway, coming from you that’s all quite a compliment. Thanks again. I’m re-doing the Architecture gallery right now – larger, better images. Should be ready within a half hour of this comment. The shopkeeper is still my fave. Has a ghostly quality. Makes me wonder and think questions. 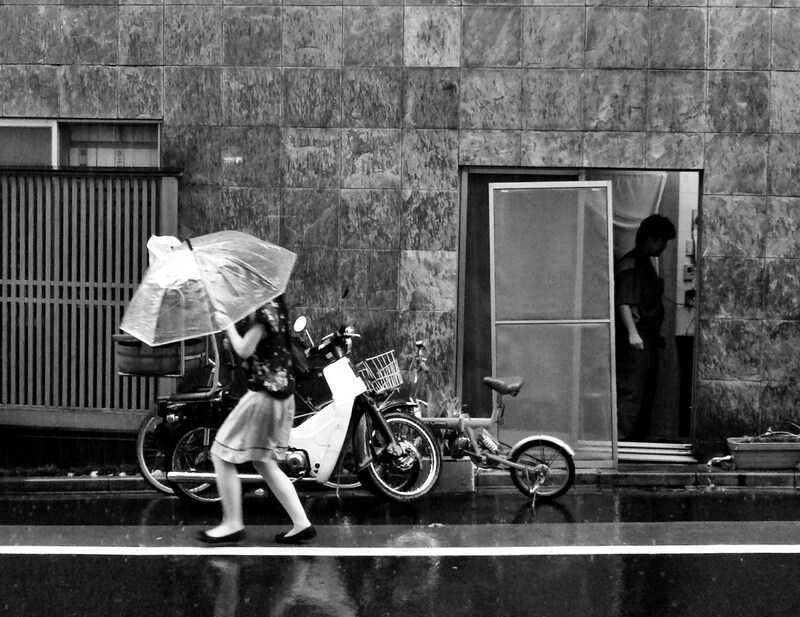 Trust the Japanese to have an evocative word even for the sound of rain. Beautiful photography, as always. Makes me feel not-so-glum about the amount of rain we’ve had lately. Rain anywhere in the world can be all introspection-making, contemplative, romantic and wistful and stuff. It’s just more so in Japan. I think they passes a law to that effect. Thanks for your sensibility and love for communication. They both appear through your very special shots of our beloved Japan. 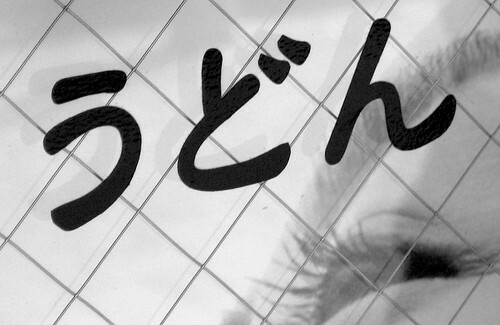 Your と思います was perfect, and made me laugh. For those who are not readers of Japanese, Roberta punctuated her beautiful words with “I think”, a very typical way for a Japanese speaker to “soften” a profound or confident declaration! Even the way the Japanese describe rain is lyrical. Yes, this that’s going on in Birmingham as I write is almost “Harusame” (spring rain), but spring’s still a couple weeks away and I can tell by the size of the raindrops (you think I kid, but I’m not) that it’s too heavy to be a gentle, soothing harusame. Thanks for the kind words and thoughts, as always. Tell the folks at the Kiyamachi Restaurant to nip off some of the big sucker leaves from that plant and the energy will go into the buds! Just kidding of course. I love the photos and even more I love being able to sit here in upstate New York and look at photos a person half way around the world is posting. I must thank the universe for the intertubes. First, when it comes to tree-pruning, I invite you to please check out the “People” gallery, scroll-down a little ways, and note the gardener (a young guy) who’s IN the tree pruning that pine tree, needle-by-needle. I kid you not. This was taken at Ginkaku-ji temple (easy to google-up). Second, well . . . I’ve twice lived in Japan and get there 1-3 times a year these days, but am currently in the Very Deep South of These United States. I’m due to be back on a plane in about 4 1/2 weeks, guiding a group of MBA students on their first foray into Japan. Looking forward to it, in fact. Please visit often and your comments are certainly welcome.